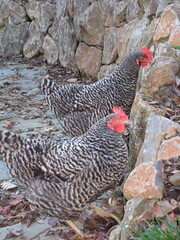 At long last, I was able to take some pictures of the girls playing around in the yard in the daylight. It used to be the only way we could tell the two of them apart was by looking at the downy feathers near their vents. Let's just say that of the two of them, ZsuZsu was the one who was "clean down there," so all we had do was wait until they turned to trot away from us and then we could be confident in calling out for that dirty pooper, aka Sophia. But sometime in the last month, it appears ZsuZsu failed to wipe (if chickens can even do such a thing), and we lost the easiest way to tell them apart. Now, we have to rely on looking at the other end of the bird to see what the crown looks like. While Sophia's crown is nice and full from one end to the other, ZsuZsu's looks partially inflated about half-way through. Otherwise, the birds are pretty much identical. I suppose we could band the legs different colors (should the crowns change shape), but until they learn to come when they're called, I think we can risk mis-identifying them in pictures and in person. What beautiful, healthy girls you have! It does look like one of them is a bit larger than the other.